RoadFighter theme is perfectly designed with all the necessary features that is the basic demand of most of the business owners. The theme comes with full width slider on the home page that allows the user to upload any size of image. The theme is simple and cleanly designed. RoadFighter is a template which is really simple to use just requires a single click to install. Now all you have to do is to edit the text and add your own images & your website is READY to use. The Theme allows the user to show his blogposts on the frontpage. Moreover the user will be able to limit the number of posts on the home page. Hence the main Home Page is always updated on the release of new blogposts. Hence the site is more Search Engine friendly. The Theme has a simple layout which attracts the clients to the Website. It’s Time to Focus on Building Your Business, Not on Building Your Website. 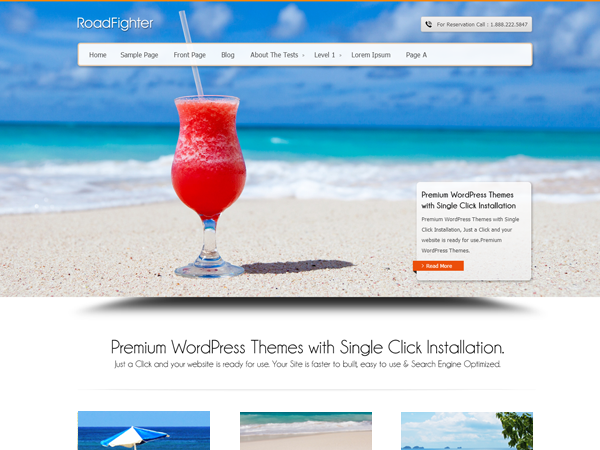 RoadFighter theme is perfect for building quick business website and is used for easy blogging with a clean and modern interface and tons of features. The layout does not distract from your content, which is vital for a site devoted to business & blogging. RoadFighter comes with various features. Any business owner who wants to create a nice website for yoga, photography, interior design, etc. can use the theme. The images will look perfect in the slider. Moreover, it can be used for various niches. Let’s know about the features of the RoadFighter.